Today we have a fun collection of 5 St. Patrick’s Men Images! All are Free for you to use. 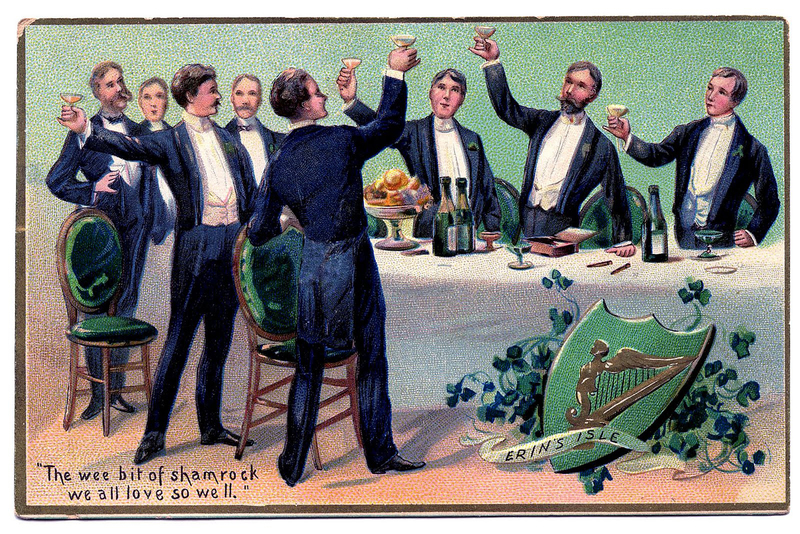 These handsome postcards feature Men celebrating St. Patrick’s Day. There are two charming young boys in spiffy green suits as well. We also have a vintage illustration of St. Patrick himself! Our cute St. Patrick’s Day Men would be perfect to use for St. Paddy’s Day Handmade Cards or a Mixed Media Collage! 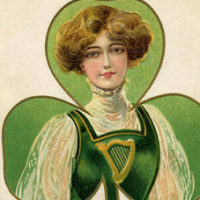 Here is a fun antique Saint Patrick’s day postcard! 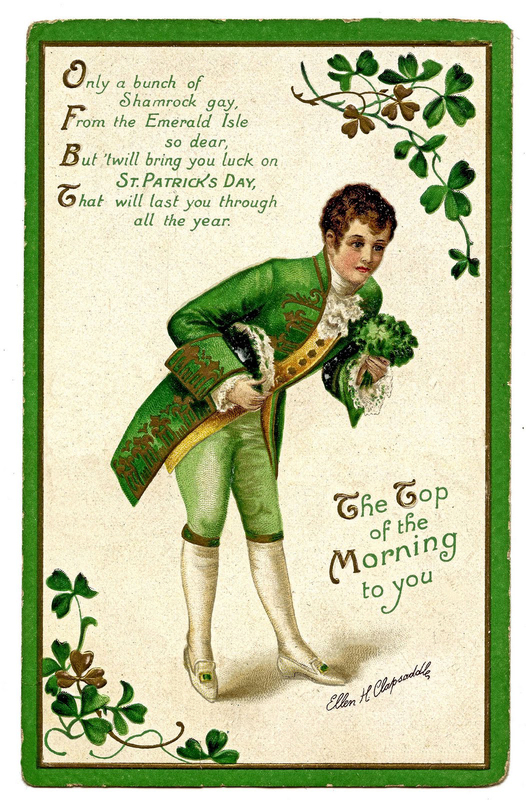 Pictured above is a card featuring a dapper looking young man with a bouquet of clover. It says “Only a bunch of Shamrock gay, From the Emerald Isle so dear, But ’twill bring you luck on Saint Patrick’s Day, That will last through all the year.” I love the classic Irish green outfit he is wearing with knne britches and stockings. His white shoes are to die for. He appears to be quite the ‘ladies’ man. Hat in hand, he seemingly is offering the bouquet to a young lady as he states the famous Irish phrase “The top of the morning to you.” Thanks so much to Marcy for allowing me to post this one! I just adore this Vintage Redhead Irishman Image of a young man who is also dressed in a spiffy Green outfit. This is another splendid Antique postcard showing a man with Red Hair, a long Green Coat, Green Top Hat, Green bow, and matching gloves. He is holding a clay pipe as he tips his hat. I believe he is saying “The Top of the Mornin’ to you!” He is kind of a quirky looking fellow, isn’t he? The artist is Ellen Clapsaddle, one of my favorite Postcard Artists! I’m sharing a fun Irish Leprechaun Image! 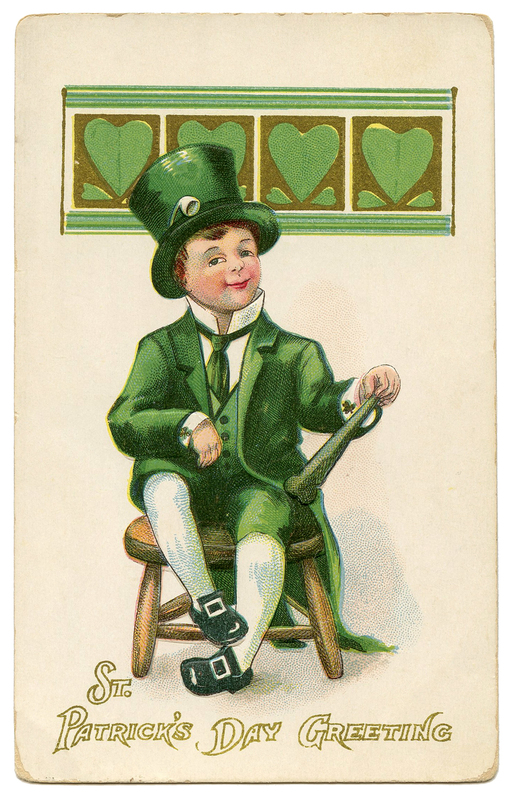 Shown above is a cute Vintage Saint Patrick’s Day Greeting Postcard. 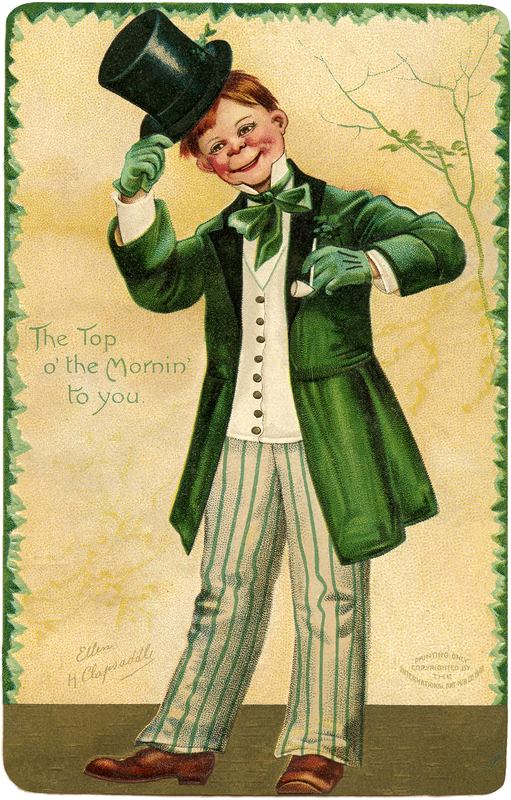 The card shows a man all dressed in Green, including his Top Hat, his Tails, and some cool Irish Shamrock cufflinks. His Green shoes appear to be similar to those the Pilgrims wore! He looks like a Leprechaun to me! 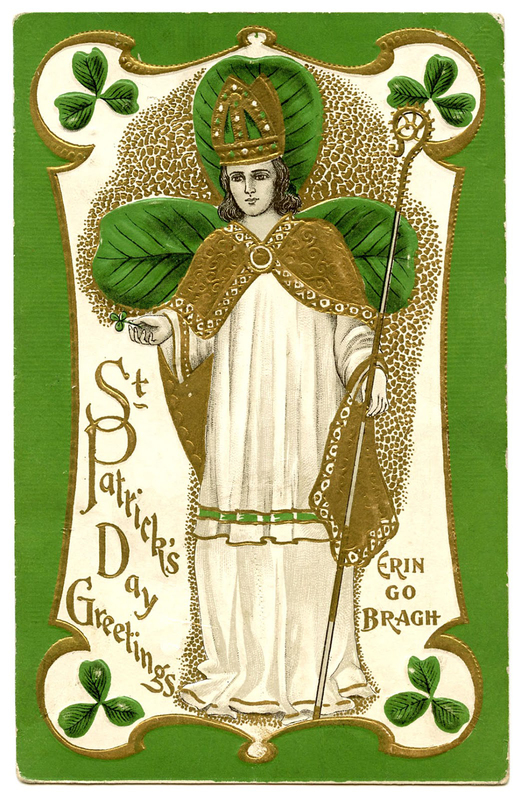 This is a wonderful Vintage St. Patrick’s Day Postcard of St. Patrick himself! He is truly a handsome fellow whom I’m sure the Irish are quite proud of! There are such lovely Green and gold tones on this picture. It’s definitely another great one for making cards! The commonly seen Irish phrase “Erin Go Bragh” means “Ireland until Eternity or Ireland until Doomsday.” This card almost looks 3D to me! Beautiful! I hope you enjoyed this curated collection of 5 St Patrick’s Men Images– Free!! You might also like our St Patrick’s Day Ladies HERE. 9 St Patrick’s Day Children – Updated! 15 St Patricks Day Clip Art Ladies – Updated 5 Clover Shamrock Images! « 5 Clover Shamrock Images! St. Patty’s Day image for cards — love it! Thank you much. Thanks Sheila, I’m glad you like it! Well…the luck of the Irish be with you! I’m Irish and I will definitely be downloading this and every Irish image you have! It will be a grand St. Patty’s Day this year! Thanks to you! Thanks so much for all your images. They are much appreciated! I believe this St. Patrick’s Day card is my all time favorite. I’ve never seen it anywhere before. Thank you!